WASHINGTON — Two U.S. citizens were released in Yemen by Houthi rebels battling the government there, the State Department confirmed Saturday. The release caps a week of turmoil in the war-torn country where the U.S. military has been drawn directly into the conflict. The Americans, who were not named, have left Yemen, the State Department said. “We welcome reports that two U.S. citizens who had been detained in Yemen were released and have arrived safely in Oman,” State Departmnt spokesman Mark Toner said in a statement. Toner expressed gratitude to the government of Oman for securing the Americans’ release. Late Wednesday ET, the destroyer USS Nitze launched several Tomahawk land-attack cruise missiles at three radar sites on the coast of Yemen. The attack came after Houthi rebels, who receive arms from Iran, fired and missed with their own cruise missiles at U.S. ships and those from other countries operating in the Red Sea. The radar sites, which guided the missiles, were destroyed, according to the Pentagon. The Pentagon has been providing logistical support and refueling to the Saudi-led coalition battling the Houthis. 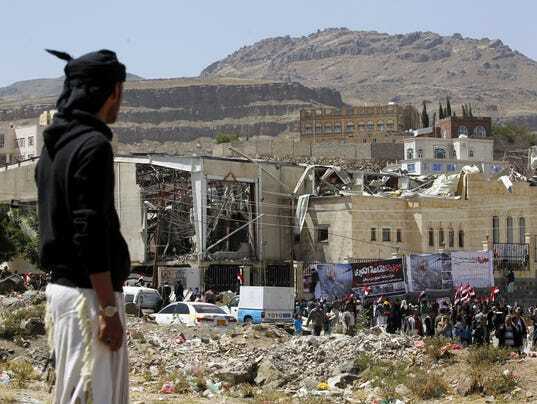 Prior to the U.S. attack, the Saudi-led coalition bombed a funeral hall in the Yemeni capital Sanaa that killed at least 140 people on Oct. 8. Sanaa is controlled by the Houthis. The Saudi Press Agency blamed the attack on incorrect targeting information provided by the internationally recognized goverment of Yemen.